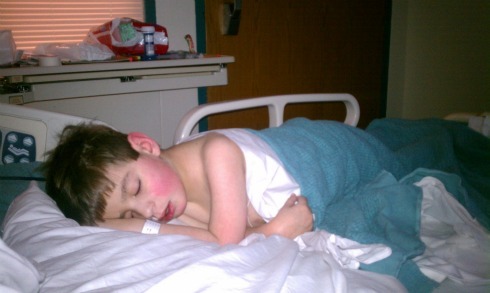 On Saturday February 19th Brisan returned home from Children's Mercy Hospital. Jenn had taken him in on Wednesday evening with concerns form our carousel & his school nurse along with ours that something was going down. He had puffy cheeks, feet were swelling, and his abdominal area was pretty hard. Back in September, these were similar things that took place. We wanted to be cautious and even more proactive to prevent him from going into distress. Jenn had asked for them to culture the inside of his g-tube hole but at the given time the consciences was that might not be the problem. Over the next day it did grow and sure enough it was another Staph infection. Along with that he has an upper respiratory infection of some kind going on to. He is at home resting and appears he will be making a recovery with the antiobotics and game plan they've set fourth for us at home. *Should be posting Parker & Duncan's birthday pictures soon! Also a news video of our family from a few years back.